When I plan for road trip I usually know where I am and I know where I need to go. I also need a way of getting from where I am to where I need to be…I need a map. To get a map these days I look online for directions or I plug the destination in my GPS system which will create a map for me. It’s simple! However, when it comes to starting to organize your pictures there is lots of confusion about everything. People don’t know how to determine where they are and they don’t know where they are supposed to go. In addition there is a lot of confusion about the way to get to the destination as well. Read on to find out how to create an efficient plan for organizing your pictures. I have been teaching quite a few people in my online course in the past few months. During this time I have learned one very important lesson. This is probably the most helpful thing for my students. The best lesson is that you need a plan! I start my class on organizing pictures with creating a road map with three parts. First you need to know where you are and then secondly, you need to know where you are going. Thirdly, you need to learn how to get from where you are to where you need to be. Most of my site, and most of my online course are about this third part but, without a good understanding of your starting point and your destination you will not be able to reach your goals. Let’s take a look at the first two very important parts of my plan for organizing your pictures. Start with…your starting point. The first part is to identify the characters of your computer story. These are things like your computer, your camera, your laptop, your tablet and your external drives for example. This is where you are and the assets you have. This should be an easy exercise, but what is a bit more difficult is to determine the role of each asset. What do you use the particular piece of hardware for? Below you will find some helpful questions in this area. How many computers do you have? List here all your computers, tables, smart phones, external drives, etc. Where do you have pictures stored? I have students that have two or three computers, a couple cell phones and one or to tablets. In addition most people have on or more external hard drives. Where do you store most of your pictures ? 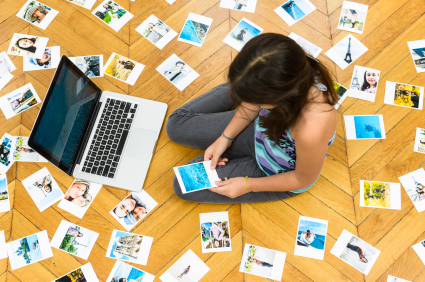 This question will help you identify the on place that will collect all your pictures. This is the catalog of all your pictures. For some people it’s easy because they only use one computer. For others it’s more complex because they have pictures scattered on multiple platforms. However, this question should force you to think about one place that will hold all your pictures. This is very good exercise to do. Identifying this one central place for your pictures will help you with backing up your pictures because this is also the place you need to back up. You have to identify your goals. In other words you need to know where you are going. When someone starts to organize their pictures seriously, there are too many things to do and it can be overwhelming so it is essential to break down your goals…the things you are trying to achieve. Where are you going? What are you trying to achieve? What would you like to be able to do with your pictures and you are not able to do right now? What do you need to learn how to do? You need to get specific like: I need to be able to find my pictures from such and such trip for example. Or, I want to know where to place my pictures once I transfer them from my camera. Things like these will help you focus on your direction. In my next articles I will elaborate on how to assess your computer setup and how to set up some realistic goals for your organization structure. Of course, the best way to learn is to enroll in my online course.